The bus coupler button is the interface between the KNX system and the user. The 1-gang rockers of the flush-mounted design lines can be inserted on the bus coupler button, 1-gang with single-point operation (slanted rocker). When using the status LED, please use rockers with control window. The switching (pressing) functions can be realised with the bus coupler button, 1-gang with single-point operation. LED display for: permanent-on or permanent-off or status. 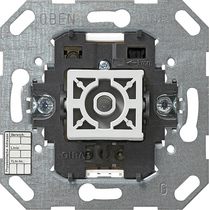 Please use System 55 adapter frame and cover for Gira TX_44 design line, IP20. Integration in the Gira F100 design line is not possible. Integration in Gira F100 not possible.